MUSKEGON, MI — Melissa Near knows what it’s like to lose a child. In 2003, Near and her husband, Chris, lost their daughter from stillbirth at 35 weeks of pregnancy. Three weeks later, her dad approached her for a support group. The Walk to Remember came to fruition from the experience and has since helped many parents with their loss. This year’s event is scheduled for 10:30 a.m. Saturday, Oct. 4 at Heritage Landing. This event was created for anyone who has been touched by the loss of a child from pregnancy loss, stillbirth or early infant death, Near said. These losses are collectively called perinatal losses, with more than a million of these deaths being recorded every year. One of the other mementos Near will bring are letters her husband writes from their daughter’s perspective. Attendees are encouraged to bring anything from baby pictures to teddy bears for the memorial table. The walk also includes a short service and a ceremonial balloon release. The walk began in 2004, shortly after the couple’s loss. 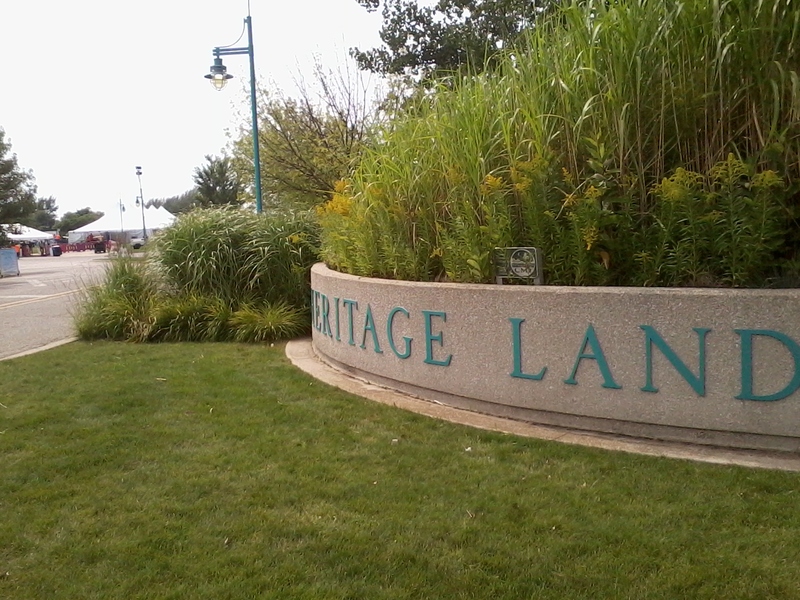 The idea came from another Walk to Remember they attended in Grand Rapids. For Near and her husband, the walk provides them with a time where they can reflect and remember their daughter. People will sing, share a poem or a story close to their heart. With the added comfort of others, the walk is one that gives parents a chance to celebrate a life. Registration and balloon personalization begins at 10 a.m. If you would like to share your story, a letter to your baby, a poem or a song in memory of a baby, contact the Nears so you can be scheduled in the program. Call 231-777-1983 and talk to Chris or Melissa. MUSKEGON, MI — A Muskegon native has been named to the Michigan Irish American Hall of Fame for 2014. 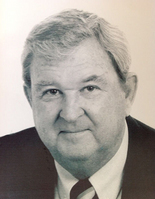 The Hall of Fame has posthumously named Stan R. Tyler Jr. of Muskegon as its 2014 member in the field of Philanthropy. The Michigan Irish American Hall of Fame was created to recognize Irish Americans who have made important contributions in various areas of life in Michigan. This year’s new members will be inducted in Muskegon at a special ceremony on the Dance Stage of the Michigan Irish Music Festival at Heritage Landing at noon on Saturday, Sept. 13. Tyler was the long-time owner of Tyler Sales Co. Inc., one of Michigan’s most successful beverage distributors. He was a major supporter of education and community causes during his lifetime in the Muskegon area. Tyler passed away on Nov. 4, 2001 at the age of 66, but not before he helped launch some of Muskegon’s major festivals. Four others were also selected to the Hall of Fame, which will include Norman R. Byrne, James L. Ryan, Michael Flanagan and Catherine Heinzman. In the category of Business and Industry, Byrne was selected for his leadership in business and his contribution to his community in West Michigan. The Ada resident founded Electrical Specialists, Inc., in Rockford, and has remained a supporter of business for more than 40 years. In the area of Public Service, the new member is the Hon. James L. Ryan of Detroit. He is a former justice of the Michigan Supreme Court and retired judge of the United States 6th Circuit Court of Appeals. Ryan also served as Military Judge in the U.S. Marine Corps and Naval Reserve for more than 30 years. In the field of Education, the Hall of Fame will be admitting Flanagan, who is the first Michigan superintendent of education to receive the distinguished service award from the National Association of State Boards of Education. The Lansing resident has been the superintendent of education for the State of Michigan since 2005. Heinzman was selected in the area of Arts and Entertainment for popularizing Irish dancing in Michigan by instructing three generations of young students. The Detroit resident is a native of Westport in County Mayo, Ireland, and founded the Ardan Academy of Irish Dance, one of Michigan’s prominent Irish dance schools. MUSKEGON, MI — The two-day Shoreline Jazz Festival kicked off on Saturday, Aug. 23 at Heritage Landing. Thousands were in the makeshift orchestral seating, while a select few hundred paid extra for the reserved seating located in the front near the performers. Ann Arbor resident Jerry Clayton, along with his wife, was among the spectators who were seated near the front. The two had never been to any of the jazz festivals that took place in Muskegon prior to Shoreline’s and said they thought they would try their luck at Heritage Landing. After only two performers, Clayton said he and his wife have already talked about returning next year. As a jazz enthusiast, Clayton said he jumps at the chance to attend any festival or concert that includes jazz. The couple had learned about the Shoreline Jazz Festival two weeks ago through an advertisement in a magazine and quickly made arrangements in their schedules. Since Clayton saw his first jazz concert 30 years ago, he hasn’t looked back. Two hours into the festival, the guitars, saxophones and drums could be heard across the grounds, blending in one uniform sound that produced the smooth and often fast-paced jazz the spectators had come for. Many came prepared with an array of umbrellas and lawn chairs. One of the avid listeners was Angela Flowers, who was seated under an enveloping umbrella that nearly doubled as a tent. Flowers, who also traveled from the other side of the state, was there to enjoy every musician. This was evident by her ability to name off all the artists that were performing. “We’ll be here for both days, but we’re not camping out, we didn’t rough it,” she said. Under her Sportbrella, the Detroit resident admitted that she, too, was a first-timer for the Shoreline Jazz Festival. However, it wasn’t her first time traveling to hear some jazz. MUSKEGON, MI — A sea of multi-colored lawn chairs decorated the grounds of Heritage Landing as the first wave of spectators arrived for the Unity Christian Music Festival. 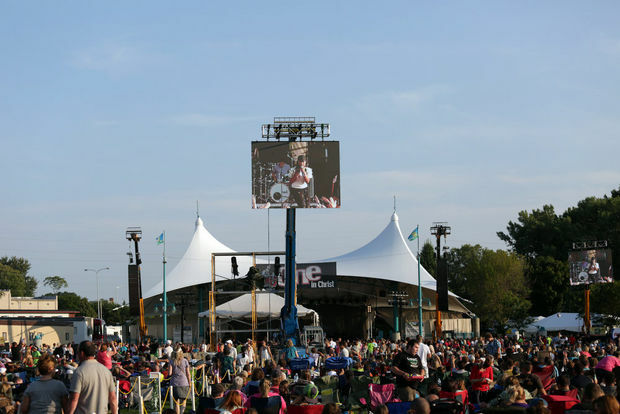 The four-day festival – which runs from Wednesday, Aug. 6 to Saturday, Aug. 9 – is one of the largest Christian music festivals in West Michigan that has increased in attendance over the years. Christopher VanOosterhout, the media and marketing director for Unity, was on hand Wednesday to see the oncoming mass enter for what they called “Day Zero.” From the look of the crowd, VanOosterhout predicted there would be at least 60,000 spectators that would come through in the next few days. The Muskegon-born festival was created 14 years ago as a three-day event, but eventually evolved into a four-day event after the seventh year to provide a free day, VanOosterhout said. For some, the festival could not have started soon enough. Holland resident Matt Stilwell first began planning for the festival six months ago. Stilwell has been coming to the festival for the last decade now. However, on Wednesday he drove up with his church’s youth group for the first time. Many spectators came prepared by hauling in blankets, water bottles and sun glasses. As the various bands began playing, a large crowd made its way down to the foot of the stage near the large speakers that shook with every drum beat. For those in the back, three larger-than-life screens were hoisted by lifts to provide a view. Half the crowd sat in its place, while others stood at attention, clapping and cheering to the music. Stilwell was among those in the crowd who decided to seat himself farther toward the back. Stilwell was not the only one to notice this. As thousands began to filter in continuously, the music itself could be heard in the streets of downtown Muskegon to as far as the Amazon Apartments building. After the first two hours, the gates were open to the public. There wasn’t a grass spot not covered by a blanket or chair. 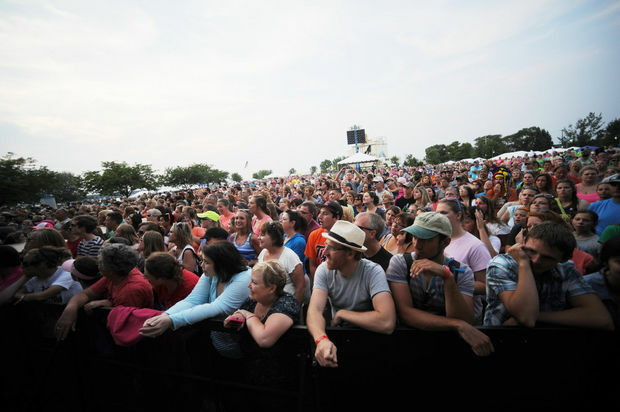 In the hours leading up to the music festival, hundreds lined the sidewalks along the railroad track on Shoreline Drive. At the front of the pack near the entrance to Heritage Landing were Heather Gillard and her friends. Gillard has been coming to the festival for years now and has gotten into a routine for the long line. As an early bird, she arrived to set up camp at 6:30 a.m., a full 45 minutes before the next group arrived. Having been to the Unity Christian Music Festival every year since its inception, the family-friendly aspect of the event is what keeps Gillard and her group coming back for more. Here is a look at the upcoming set lists for the Unity Christian Music Festival. All times, dates and artists should be considered tentative. For additional information, readers are recommended to access the web site here. THURSDAY: Band line-up from 2-9 p.m. in order will include Joel Weldon and the Unity Choir, All Things New, Love & The Outcome, Rend Collective, Big Daddy Weave and Third Day. FRIDAY: Band line-up from 2-9 p.m. in order will include Joel Weldon and the Unity Choir, Everfound, Jason Gray, Hawk Nelson, Britt Nicole, Keewani’s Story and Matthew West. SATURDAY: Band line-up from 2-9 p.m. in order will include Joel Weldon and the Unity Choir, The Neverclaim, Aaron Shust, Sanctus Real, Graham Saber, Mandisa and Steven Curtis Chapman. MUSKEGON, MI — Jason Pittman and TeAngelo Robinson love cars. In fact, they love cars so much they decided to get together four years ago to create a car show in Muskegon. 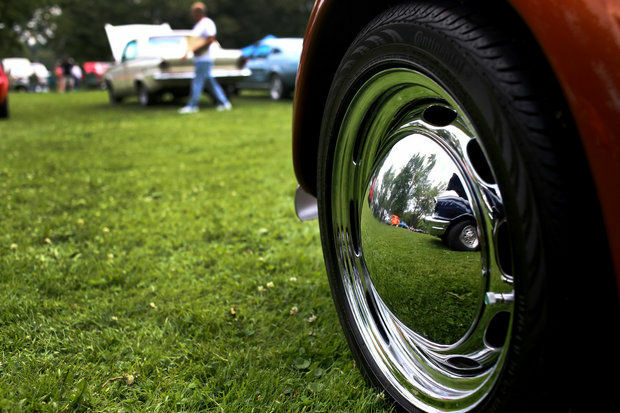 The Midwest Showdown Car and Bike Show, which was previously held at Mona Lake Park in Muskegon Heights, will move to Heritage Landing and take place Sunday, July 27 from noon to 8 p.m. The car show will include awards that will range from Best Paint Job to Best Interior. The awards ceremony is set to begin at 6 p.m. The entry fees are $20 for cars and $15 for bikes. According to organizers, the event outgrew the space at Mona Lake Park, as each year the numbers increased considerably. After speaking to officials at Heritage Landing, Robinson said, the two car enthusiasts were told there had never been a car show there before. Before agreeing to move the car show to Heritage Landing, the two promoters briefly considered taking it to the racetrack in Martin, but quickly discarded the notion. The two have restored older vehicles in the past and wanted to do more, but on a larger scale. That’s how they wanted to stand out from other car shows. With about 75 percent of the car show’s participants being from other cities, their main intention was to bring some attention and revenue to Muskegon. MUSKEGON, MI — Thousands of spectators lined the streets of downtown Muskegon as the Budweiser Clydesdales made their way up Western Avenue on Wednesday, July 2. As part of the Here’s to the Heroes festival, which focuses on the military veterans of the community, the Clydesdales kicked off the five-day festival with a parade that led back to their stations at Heritage Landing. Despite the parade starting at 7:30 p.m., Shanon Rederstorf was one of the first on scene at the roundabout located on Third Street and W. Western Avenue. The Muskegon resident was in search of prime seating as she brought her granddaughter to see the Clydesdales. As the parade began and the fabled horses came within site, people from all over West Michigan stepped out past the curb to get an early look. One of those eager spectators included Fruitport residents Heather VanDonkelaar and her 2-year-old daughter, Konlee. Leading the pack was the color guard, where applause followed the officers as they continued along the parade route. Next came the eight Budweiser Clydesdales, equipped with their tethers and braided manes that were topped with red-and-white flowers to match the very beer they carried. Bringing up the tail end of the parade were several military vehicles, followed by the American Red Cross, the U.S. Coast Guard, and fire/police department vehicles representing Muskegon, Norton Shores and Fruitport Township. Not everyone was out for the horses alone, as Laurin Jahnke said he drove in from North Muskegon to be with his family and pay tribute to the veterans. Jahnke said he was lucky enough to have seen the Clydesdales in person before, once in Detroit and again at Double JJ Ranch in Rothbury. However, he wanted his wife and three stepchildren to witness the Clydesdales for themselves. While stationed along Western Avenue near the Tipsy Toad Tavern, Jahnke had time to think back on some of his favorite Clydesdales commercials. Many missed their chance at a second viewing of the Clydesdales, as a good portion of the crowd left as soon as they got a glimpse. Dozens more followed the eight horses as they made brief stops at the roundabout, as well as Mike’s Saloon and the Tipsy Toad Tavern. While at the local bars, a member of the crew stopped to deliver a ceremonious 24-pack of Budweiser to an awaiting patron. After making a loop through downtown Muskegon, which took nearly an hour to do so, the Clydesdales stopped for photo opportunities one last time before crossing Shoreline Drive into Heritage Landing.